Matthias Müller was born in Bielefeld, Germany in 1961. 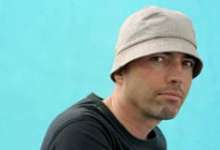 Müller is an artist working in film, video and photography. He is based in Bielefeld and Cologne, Germany. Studied Arts and German Literature at Bielefeld University and Fine Arts at HBK Braunschweig. Master’s degree. Since 2003, Professor in Experimental Film at Academy of Media Arts, KHM, Cologne. Müller organized numerous avant-garde film events such as the "Found Footage Film Festival" (1996 & 1999) and the first German festival of autobiographical films "Ich etc." (1998) and various touring programs. With his films and videos he has taken part in major film festivals worldwide, including the festivals at Cannes, Venice, Berlin and Rotterdam. His work has also been featured in several group and solo exhibitions. His films and videos are part of the collections of institutions such as Centre Georges Pompidou, Paris, Museu d’Art Contemporani, Barcelona, Nederlands Film Museum, Amsterdam, Australian Centre For The Moving Image, Melbourne, Kunsthalle Bielefeld, the Goetz Collection, Munich, the collection of Isabelle and Jean-Conrad Lemaître, London, and Tate Modern, London.